Lying at almost 650 metres above sea level and more than 300km away from the nearest seaport Madrid had little to recommend it as a capital city when Philip II decided to move his seat of government there from Toledo in 1561 and relocate to what was little more than a provincial town in those days. Today Madrid is a vibrant capital city of around 3½ million people which attracts thousands of short break visitors every weekend of the year. Its renowned art scene, splendid architecture, notorious nightlife and world famous football clubs ensure the city’s future as one of Europe’s great short break destinations. As Europe’s highest capital city located in the very centre of the Iberian Peninsula the winters in Madrid are often very cold and summers are scorchers yet somehow I always found the climate in Madrid quite pleasant during my decade there. The beautiful blue skies throughout much of the year certainly made up for the cold and the spring and autumn months were a glorious time to be in the city. Sitting outside a café in winter with a ‘café con leche’, a ‘pincho de tortilla’ and the Marca football newspaper is still one of life’s great pleasures for me! Weather: The local saying about the climate in Madrid is “9 months of winter and 3 months of hell”. Although this is not strictly true, the summer months of July, August and September do tend to be very hot but due to the lack of humidity. However, the heat doesn’t tend to be particularly oppressive as it’s a very dry heat that is far easier to cope with than similar temperatures in a humid climate. Having said that I wouldn’t recommend that you plan a visit to the city in July or August if you have a choice. Not only can temperatures get seriously high during those months but also many Madrileños will have headed off to the beach leaving the city quieter than usual with quite a few bars and restaurants taking summer holidays. The weather in Madrid winter can be quite cold but there are often blue skies and some sunshine and in general there is not too much rain. Below is the current Madrid Weather and the latest forecast. Beneath that are two graphs showing the city’s average monthly temperature and rainfall statistics. Fiestas: In terms of planning your visit to coincide with festivals in the city a good time to go is in May when the annual San Isidro festival takes place. There are street parties throughout the month and every evening the bullfighting arena at Las Ventas is sold out as the very best bullfighters perform on the biggest stage. For football fans hoping to watch a Real Madrid game at the Santiago Bernabeu Stadium the season usually lasts from early September until early May with most league games taking place on weekends and European Champions League matches on Tuesday or Wednesday. Art lovers should check opening times of galleries and museums as many are closed on Mondays. Getting There … Madrid’s Barajas Airport is Spain’s 1st and Europe’s 4th busiest airport with around 50 million annual passengers. It lies about 12km to the northeast of the Spanish capital. The airport is well served by national carriers including Iberia (60% of total traffic) and British Airways attracting flight arrivals from all over the world including direct flights from the USA. There are also a number of budget airlines offering flights to Madrid who tend to change their routes and timetables on a regular basis. There are also many domestic flights which connect with regional Spanish airports all over the country which is an option to investigate if you can’t find a direct flight to your chosen destination. Most arrivals come into Terminal 4 which is one of the world’s largest airport terminals. In 2014 the airport was renamed ‘Adolfo Suárez – Madrid-Barajas Airport’ in honour of Spain’s first democratically elected leader following the Franco era. If you’re visiting Madrid from elsewhere in Spain the city is extremely accessible by train thanks to the excellent rail network which provides fast transport on high speed trains to major cities including Barcelona, Malaga, Seville, Valencia and Alicante. Most train services arriving through France go to Barcelona from where the rest of Spain becomes accessible. Getting Around … If you’re on a city break with the intention of spending nearly all your time in Madrid then please don’t rent a car. Traffic is heavy, roads are fast and confusing, drivers are aggressive and parking is hard to find and very expensive. Instead make the most of Madrid’s public transfer system which allows you to get from the airport to the city centre by bus or Metro very efficiently. Of course there are always taxis available for transport from the airport and a number of private shuttle bus and private transfer options. In the city itself you’re likely to do plenty walking as it’s no great distance between the Royal Palace, Plaza Mayor, Puerta del Sol and Paseo del Prado. However, if you’re not up to getting around on foot there’s a great public transport system. Just buy a ten journey ‘Metrobus’ ticket which allows you to interchange between the Metro and bus services. Another popular way of seeing the city amongst tourists is to get one of the hop-on, hop-off bus tickets though I’m not a big fan of this option in Madrid as the city centre traffic can spoil the trip. I used to head into Madrid on a Saturday afternoon and check into one of the many hostales or pensiones scattered around the streets surrounding Plaza Mayor. These small, often family-run places, provide a great budget option for travellers with clean en-suite rooms located in the very heart of the city centre. 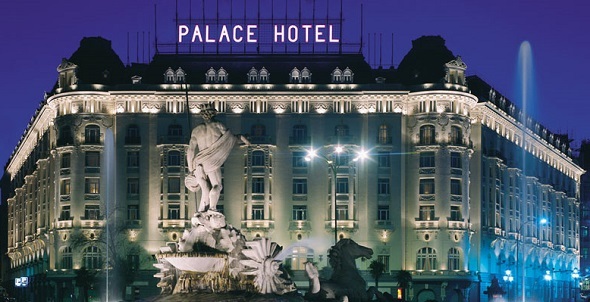 Hotels in Madrid are precisely what you’d expect of a major capital city ranging from simple 2 and 3-star options to the opulence of major 5-star establishments such as the magnificent Villa Magna or Westin Palace hotels. Over the past twenty years or so there’s been a significant growth in the number of boutique hotels in the city such as the Hotel Orfila which is a charming places to stay in a 19th century palace. As Madrid is a major European business centre you can often find good hotel rates at weekends when hotels frequently have special offers on their vacant rooms. Personally I’ve become too practical in my old age and find myself looking for self-catering apartments when we’re staying in cities. There’s nothing like a nice cup of tea on your own balcony before heading out to see what the day has to offer. Living in Madrid I was always quite surprised at the extent to which Barcelona was so much more popular as a city break destination. Of course the magnificent Gaudi buildings and its coastal location give the Catalan capital an undoubted advantage but Madrid has so much to offer its visitors. 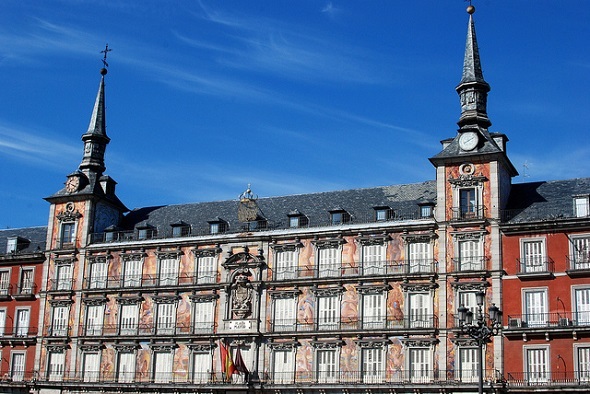 A walking tour from Puerta del Sol to Plaza Mayor and along to the Royal Palace is a great way to appreciate the history and architecture of the city. Culturally there can be little doubt that Madrid’s ‘Art Triangle’ is the number one attraction. Located on Paseo del Prado are the Prado, the Reina Sofia and the Thyssen Bornemisza. It is these three art museums in particular which make Madrid one of the world’s great art destinations. In the world of ornithology a ‘twitcher’ is someone who will go to great lengths to see a rare species. If there is such a person in the world of art then they will surely head straight for the Reina Sofia gallery in Madrid which is home to Picasso’s Guernica. This is not only Madrid’s number one exhibit but is also one of the most famous works of art in the world. As well as these top Madrid Attractions I’d highly recommend that you take some time out at the ‘Parque del Buen Retiro’ which is a beautiful park right near the city centre providing an ideal solace away from the summer heat after a few hour’s sightseeing. If you happen to be in Madrid on a Sunday morning get the Metro to La Latina and have a wander around the city’s fascinating weekly flea market known as ‘El Rastro’. This is a real Madrid institution which is well worth a visit but do be careful with your belongings as there are pickpockets operating in this area). Go to a Football Match … As I’m much more a football fan than an art enthusiast I must admit to having ‘done the Prado’ in less than an hour on my first visit to Madrid as I eagerly headed up to the Bernabeu Stadium to watch Radomir Antic’s first game in charge of Real Madrid in a 1-1 draw with Real Oviedo. In my defence I’ve returned to the Prado many times since and have learned to appreciate the wonderful works of El Greco, Diego Velazquez and Francisco Goya to name but a few. By the way, there was a PE teacher where I worked in Madrid who held the record for a tour of the Prado which still stands at 42 minutes. He too spent more time in the Bernabeu! Football tourism is a popular pastime these days as fans travel to matches all over Europe to watch some of the world’s most famous teams and players in iconic stadium. Watching Real Madrid in the Bernabeu would certainly come high on every football fan’s checklist. But don’t forget Atlético Madrid who against all the odds won the La Liga title in 2014. Nowhere in Spain will you find more passionate fans and experience a greater atmosphere than watching an Atlético match in the Vicente Calderón stadium. Go to a Bullfight … Although the bullfighting season in Spain lasts from March to October its arrival in Madrid is in May when the Las Ventas bullring hosts the country’s main event during the festival of San Isidro. This month sees every top bullfighter in Spain appearing in the capital where, like it or loathe it, there is no escaping the fact that the bullfight remains very popular. In the Madrid region the government has given it cultural heritage status, an approach in stark contrast with Catalonia and the Canary Islands which have banned bullfighting altogether. Go to a Flamenco Show … Whilst flamenco dancing is typically an Andalucian affair it is well represented in the capital and has enjoyed quite a revival in recent times as contemporary artists have combined traditional flamenco music with more modern genres such as jazz or blues to create something which holds more popular appeal. There are some great venues to watch flamenco in Madrid ranging from cozy bars to larger scale ‘tablaos’ where you can enjoy dinner or tapas with a major performance by a variety of artists. Whilst Madrid is famous for Madrileños who don’t go out before midnight, stay out all night then watch the sunrise as they leave a nightclub this probably isn’t what most weekend visitors are looking for. Although I enjoyed such nights as a youngster I was always left wondering what people did until midnight and how they survived the following day. The answer seems to be to sleep most of Saturday evening then spend more time dancing than drinking whilst you’re out which seems wrong on so many levels. It’s really very easy to enjoy Madrid’s nightlife and get to bed at a reasonable hour. An ideal evening for me is to start the evening with a cold bottle of Mahou beer at one of the terrace bars in Plaza Mayor then wander over to Plaza Santa Ana and Huertas for a stroll around some of Madrid’s great tapas bars. On a different night I like to go to the ‘Cuevas bars’ below Plaza Mayor to revisit ‘Mesón del Champiñón’ on Cava de San Miguel which was the first bar I ever went to in Madrid. Just along the street is Restaurante Botin (the world’s oldest restaurant according to the Guinness Book of Records) which is always a great spot for lovers of roast meat. Dining out in Madrid is such an adventure with hundreds of places to choose from ranging from simple ‘Económicos’ in local ‘barrios’ (neighbourhoods) such as Lavapiés to Michelin star establishments. As well as restaurants representing the whole culinary diversity of Spain there’s also plenty influence from South America as well as Asian cuisine. Madrileños have a great appetite for fish and Madrid’s fish market is the second largest in the world after Tokyo. Combined with the highest quality of meat from the north of the country you’re never far away from a great meal in Madrid. Typical Madrid dishes to look out for include ‘cocido madrileño’ which is a heavy stew based on chickpeas and ‘rabo de toro’ (bull’s tail) which is at its best in one of the bars near Las Ventas during San Isidro. Perennial favourites in the city’s tapas bars are ‘tortilla de patatas’ and ‘patatas bravas’ whilst a squid sandwich (‘bocadillo de calamares’) is a must at some point during a Madrid bar crawl. A pleasant end to the evening can be spent in one of Madrid’s old cafes where the politicians of the past used to meet to help create the city and society we have today. Or if you have immersed yourself in late night partying head for the famous ‘Chocolatería San Ginés’ which is open 24 hours a day and has been churning out ‘chocolate con churros’ since 1894. Whenever you visit a city for the first time you’re always tempted by the excursions on offer to nearby attractions. Often we find we don’t have enough time to include such day trips in our schedule as we’re so busy discovering the city itself. In the case of Madrid I would urge you when booking your visit to try to allow time for at least one of the fabulous day excursions which are available from the city. Of all the places I’ve ever lived nowhere compared with Madrid in terms of proximity to other great places to visit. My personal favourites is a trip to Segovia although I must respect popular opinion and say that the number one excursion from Madrid is to the former capital of Toledo. The other main trip offered by tour agents is to the Royal Palace at El Escorial. If you’d simply like to get out of the city for a few hours and see something of the mountains of La Sierra de Madrid there are buses leaving Plaza de Castilla which go to Manzanares el Real and continue on to the lovely village of Miraflores de la Sierra where we used to live whilst I worked in the centre of Madrid.